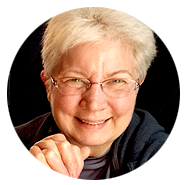 Want to deepen your spiritual practice? You’re in the right place. I’ve made this site a comfortable and attractive place to spend some time, and I’m very excited to share it with you. Please relax and stay a while. Visit my blog pages, check out the information on essential oils, learn a bit about hypnosis and hypnotherapy, read about my programs. I take a holistic, natural approach to health and well-being. Both aromatherapy and hypnotherapy work at the level of the subconscious to bring healing and hope to troubled areas of the body, mind, emotions, and spirit. They bring harmony and balance to all aspects of our lives. So — I hope you relax and enjoy yourself for a few moments – or more. I’d love to hear from you. Click on the contact button and send me a question, comment, or just make the connection. I look forward to getting to know you. I’d love to hear about your story. Please get in touch with me with the email below and provide as many details as you can. Joy is prayer; joy is strength; joy is love; joy is a net of love by which you can catch souls. make your own decisions surrounding your health care and spiritual wellness. Please read our full disclaimer for further details. © Essentially Holy. All rights reserved. Get your FREE copy of In Search of Soul! 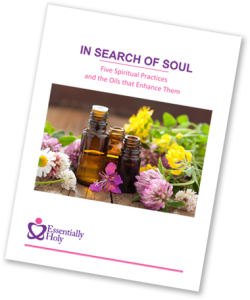 Find out how essential oils can deepen and enhance your spiritual practice — sign up and receive our eBook for free!